Culture is deep rooted in the lives of the people of Mayurbhanj District. The vibrancy and richness of the cultural heritage of this District, undoubtedly, makes Mayurbhanj one of the most noteworthy places on the map of Odisha. Makar Parva and Karama Parva are the two well known festivals of Mayurbhanj District which are celebrated with great pomp and show. 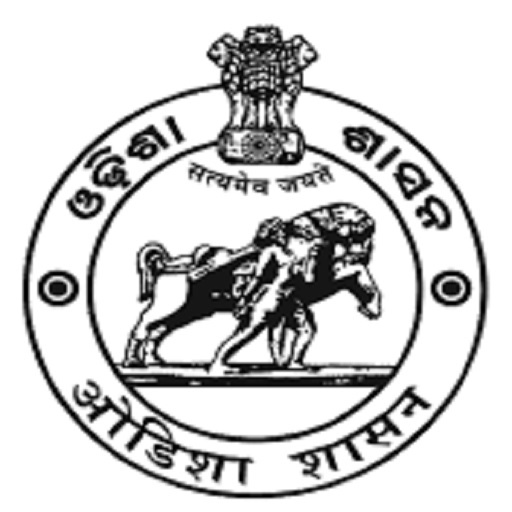 Mayurbhanj District unfolds an enormous panorama of nature`s beauty. In the midst of the surroundings evolved a beautiful yet virile dance form, known as the famous Chhau dance. This dance form has gained worldwide fame and recognition. It is noted for its beauty, vigour and marvel of the art. Jhumar, the popular traditional folk song, is inextricably interlinked with Mayurbhanj District. These songs depict the thought of the populace festivities, marriages other social functions, sorrows and happiness. Apart from Puri, Lord Jagannath is worshipped as Shri Shri Haribaldev Mahaprabhu at Baripada. There goes a saying that Maharaja Baidyanath Bhanj had been to Puri to have a Darsan of Lord Jagannath. Failing to offer the demanded gold coins the king was denied to have a ‘Darsan’. Another version to the legend goes like this. When the Maharaja went to Puri in rayal splendour with the accompaniment of ‘CHHATRO’ and ‘CHAMORO’ the Gajapati of Puri refused permission as it was display of higher status que over the ‘Thakur Raja of Puri’. The prevailing custom then was that the devotees to Puri will come as common man without showing of any supremacy over the Gajapati ‘who is Chalanti Vishnu Designate’. The Maharaja went in penance near the Atharnala, outskirt of Puri. In a dream he was ordered to by Lord Jagannath to construct a temple in Baripada so that he would come down to aasuage his devotee. Showing deference to wishes of Lord Jagannath he got constructed the majestic temple at Baripada. Like Puri, all the rituals for Lord Jagannath, Lord Balabhadra and Devi Suvadra are perfomed here at Baripada. The Bhanja Rulers, whose royal patronage in the field of architecture was at par excellence, would be remembed for their magnificent offering to Lord Jgannath in getting built the Jagannath temple prototype of Puri. The District of Mayurbhanj preserves many temples built in different styles of Orissan architecture, such as Rekha, Bhadra and Gauriya. Among the Rekha temples the most important are the temples of Kakharua Baidyanath at Manatri of this District and that of Lord Jagannath at Baripada. The temple of Lord Jagannath at Baripada is universally known as Haribaldev temple. It was built by Shri Baidyanath Bhanj in 1575 A.D. on the same architectural principles of Kakharua Baidyanath temple. The temple stands as a symbol of the religious favour of the Bhanja Rulers of Mayurbhanj and is regarded as the Queen Monad among the princely states during the pre-merger days. It is made of laterite stone with exquisite designs engraved in the walls. It has height of 84′-6″. A big boundary wall encirles the temple which is a replica of that of Lord Jagannath at Puri. An inscription on the temple wall states that in the year 1497 of the Saka Era this temple was built by Baidyanath Bhanj. This temple, like the Kakharua Baidyanath of Manatri is provided with Vimana, Jagamohan and Nata Mandira and is in a better preserved condition than the latter. Besides the presiding deities, there are as many as seventeen Bedha deities consecrated in the temple. There are various other pillars, images and structures both in front of the presiding deity and on the body of the temple. This temple is provided with Nata Mandira and is beautifully painted inside as well as outside. Every year Car festival is celebrated on the day after the day on which Car festival is celebrated at Puri. 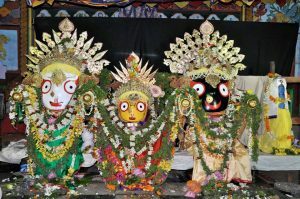 The three deities come to the Radhamohan Temple (Mausimaa Mandir) during car festival which lasts for two days. 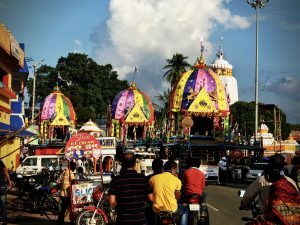 The speciality of the Baripada Car festival is that only ladies can pull the chariot of Maa Subhadra. In the back drop of Rofty Similipal Forest with gorgeous waterfalls, winding rivers, huge summits and lush green valleys, the district of Mayurbhanj unfolds a vast panorama of nature’s beauty. Amid the surroundings evolved a beautiful yet virile dance form, known as famous CHHAU DANCE. 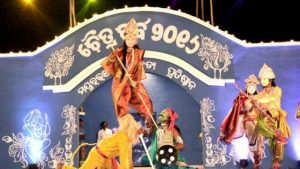 The fame of Mayurbhanj Chhau has crossed geographical limitations and has claimed world wide fans for its beauty, vigour and marvel of the art. Though Chhau is famous not only in India but World over the origin of word Chhau is yet in mystery. Chhau is believed to have found its origin from “Chhaya” the shadow. But the Chhau performers of Purulia use Mask while dancing and that mask is told as “Chhau”. Perhaps Chhau Dance might have derived its name from that mask,the Chhau. Some chhau pundits opine the Chhau has got its name from “Chhaushree”. Inarguably, the word chhau has been derived from the word ‘CHHAUNI’ the camp camped at the time of military operation. The folks say that chhau was performed to entertain the Oriya warriors inside the camp and has spread now knowing no boundaries. Chhau is glorious heritage of Mayurbhanj. The enlightened kings of Mayurbhanj like Maharaja Shriram Chandra Bhanjdeo and Pratap Chandra Bhanjdeo, one of the builders of modern Orissa composed the famous “War-Dance” and presented the same in 1912 at Calcutta in honour of George V, the British emperor, who got dazed at the beauty and splendour of Mayurbhanj Chhau and appreaciations were showered from the press and the elites. 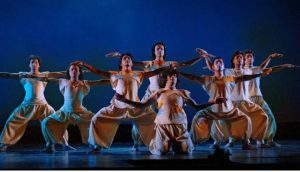 Thematically, Chhau draws substantially from great epics like the Ramayan, the Mahabharat and also from folk and tribal elements. The presiding deity of Mayurbhanj Chhau is Lord “Bhairab”. Mayurbhanj chhau is world famous now. The visual poetry is the name of Mayurbhanj Chhau. Set in a style that is free, intense, stormy dynamic yet lyrical. The prevalence of Jhumar dates back to 18th century but not in organised form. Local folks of Odisha, Jharkhand, Bihar and West Bengal used to practise Jhumar songs and dance to beat boredom and monotony after days hard work which was energising for further work. Even when they were on their way to distant places in quest of work their lips were stuck with melodious, lyrical and colloquial Jhumar Songs. Gradually a Nachuni group was introduced which consisted of eight to ten people, including one Rasika (the leader of the group) one Nachuni and instrument players for FLUTE, HARMONIUM, DHOL, CHAD-CHADI, MAADAL, MAHURI etc. 18th century downwards Raja (King), Maharaja (Emperor), Zamindar (Land Lord) noticed Jhumar and they became so charmed by the language, sweet tunes and dance that they could not but patronise it which helped remove the financial constraint of Nachuni Groups which further paved its way to earn recognition in upper level of society. There are two types of dances in Jhumar dance. When a single lady dances, it is alled ‘NACHUNI’ and when dance is performed in a group it is called ‘PANTA DANCE’. Jhumar songs are tune based. Its main element is tune, that means SWARA PRADHAN and its rhythm is typical of its own. Lyrics are descriptive mainly of Radha Krishna’s love.